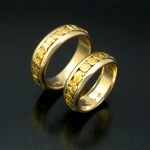 Placer Gold Design offers 3 styles of natural nugget gold bands in 4 widths, appropriate for ladies and gents. 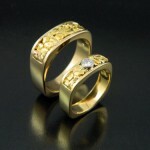 A choice of 14kt or 18kt yellow, white or rose gold is available. Platinum is available by request. All of Placer Gold Design’s rings are of premium weight and are styled for maximum comfort. The natural gold nuggets are from historic goldfields throughout Alaska, Yukon Territory and British Columbia. The mines are small scale family operations working a very limited summer season. Only a very small percentage of the gold mined is of ideal quality for fine jewellery. The average purity is 21kt. Each piece used for inlay in the rings is carefully placed and gold soldered into place. A minimum of cleaning and polishing is done to ensure the natural texture and color is left intact. 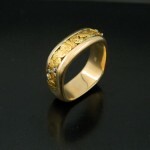 A very important feature of the gold nugget bands is that they utilize gold in its natural form. Each ring has a unique color and texture not found in any other jewellery. The use of natural gold that has not gone through any refining process guarantees the wearer that this is truly virgin gold that has had no previous owner. Pave set diamonds in white gold are available for the square shank with round center style. Bezel set diamonds are available in white gold for soft square center and shank style. Diamonds used are of minimum F color and VS1 clarity for maximum value. Please contact Placer Gold Design directly for diamond options. 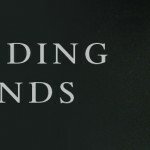 To see our full collection of Wedding Bands for sale in our online store, click here.